Back in the USA at last. We had to clear immigration in Portland, which took about 2 seconds–there was a short line for US citizens, the agent took a very quick glance at our passports and we were cleared. Life should always be so easy. The bus tour had some significant failures today, but none of them were the fault of the cruise line. Northeastern Charter & Tour, the bus line, has a lot to answer for. First, we got on the bus and I noticed that it had not been cleaned–there was a cup half full of soda in the seat-back holder in front of me, and a partial bottle in the seat next to it. I told the cruise representative, and instantly heard the driver say he had checked the bus. Hah! The cruise lady got a plastic bag, started at the back and filled it with trash. Then we started off, and the guide began her spiel. Apparently, the north east has a public building called a “liberry” because she talked about a lot of them. She also had to tell us 10 or 15 times that all the good leaves got blown away in a wind storm last week. The guide wasn’t a bus company employee, she works for a company called Destinations North America. I’m not too fond of them, either. The tallest building in the State of Maine is 16 stories. I remember that from the tour of the city. There are a lot of churches, but not enough people to support or heat them. There seems to be a program to convert old schoolhouses into condos. I don’t know why there are so many old schoolhouses–there seem to be plenty of people. Perhaps that’s something the guide could have addressed while pointing out yet another conversion. We drove to a great lighthouse, which is the picture at the top. Getting out was staggeringly cold, with a 40 knot wind ripping through our coats. It was all worth it for the sight of this beauty and the opportunity to take photos. There was a small food wagon on-site offering lobster rolls. Despite the frigid weather, they do not sell hot chocolate or tea or coffee. I suggested he could charge $40 a cup just then, but that seemed like a new idea to him. Which explains why he has a small food wagon instead of a chain of successful hot chocolate stands. 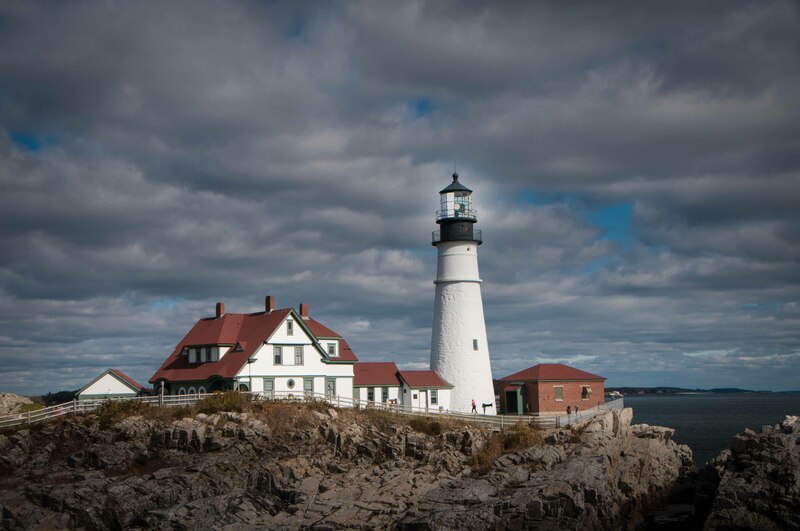 Leaving the lighthouse, we headed for Kennebunk and Kennebunkport, neighboring communities made famous as the summer retreat of the good Bush, President #41, George Herbert Walker Bush. He and Barbara reside here in the summer in the family compound purchased in 1920 by his grandfather for the huge sum of $20,000. It’s called Walkers Point, and looks fabulous. 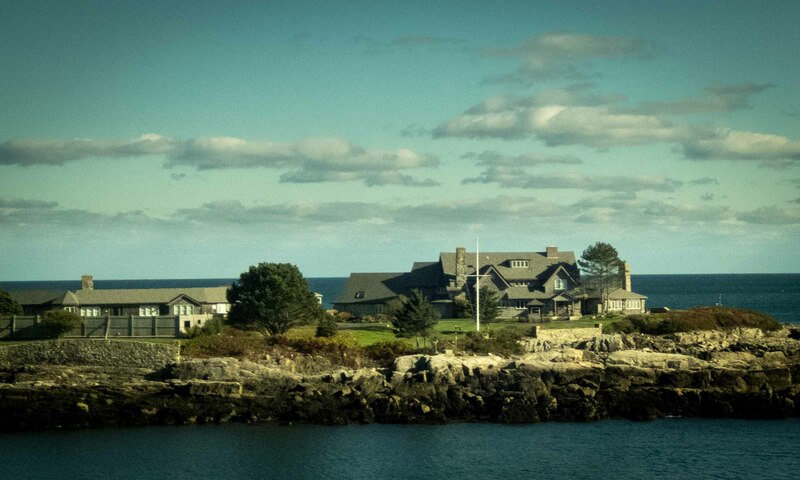 Walker’s Point, summer home of George and Barbara Bush. The flag would be flying if they were in residence. The bus parked and we had a couple of hours to eat lunch and explore Kennebunkport. 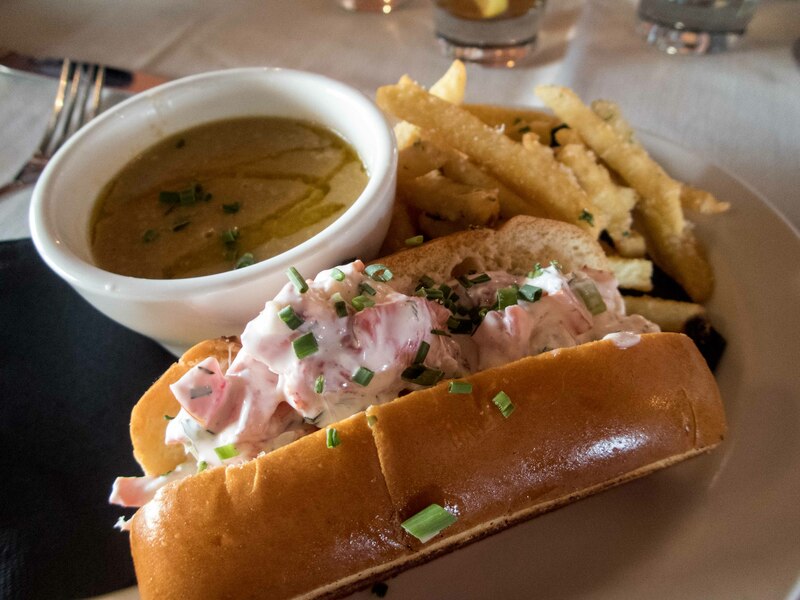 Lunch was foreordained when I saw a sign promising a lobster roll and corn chowder. The restaurant was interesting, with a wood burning furnace in the dining room sporting a roaring fire–which was good because the front door was kept open. Eventually the fire won out and the room was decently warm. They played a tape of Italian music, which only had about 8 songs on it. I only really recognize one grand opera aria, Nessun Dorma from Turandot. When it comes around for the second time in an hour I know the tape needs more material. Gail and Brad went back to the bus after lunch; they weren’t feeling all that well. Kate and I strolled the town, peeking in all the souvenir stores. Many were clearing out their merchandise prior to closing down for the winter. There isn’t much to do here when Poppy and Barb have gone and it’s too cold to swim. Love locks—padlocks that lovers put on a bridge, then throw the key into the waters below, to symbolize their lives locked together for all eternity. Or until the city cuts the entire thing off the bridge. 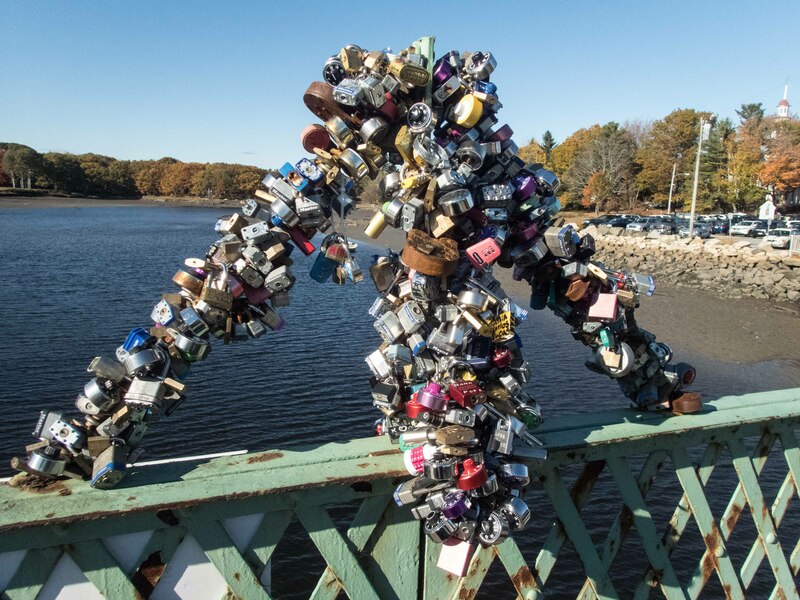 This tradition began in Paris on the Pont des Arts bridge, which has led to so many locks the authorities have had to replace large parts of the structure when the locks became too heavy for the bridge to support. We got a text from Brad–they got back to the bus, which we were told would be open, and it was locked with no driver or guide to be found. Brad and Gail were back where we ate lunch, right in front of the wonderful fireplace. At the stated time, we all went back to the bus, where the driver had reappeared, and started driving the area, which is beautiful, filled with summer “cabins” of the old money crowd. I thought of taking some photos through the bus windows, but they hadn’t been washed in an age, so that was a non-starter. I’ve always thought the bravest people in the world were the British tour bus drivers, maneuvering their huge right-hand drive buses through the narrow streets of left-hand drive Paris. I know it’s a hard job. Still, the streets of Kennebunkport aren’t quite as difficult as Paris, and yet our driver managed to make a right turn without looking in his mirrors and only the shouts of the passengers kept him from knocking over a stop sign. He bent it pretty good, but if you drive away fast enough nobody will ever know. On most bus tours, at each stop the driver gets out and stands by the door to help people down the steep stairs. I noticed that our driver didn’t do that, nor was he wearing any sort of uniform. The bus rattled, squeaked and shook on the highway as if it hadn’t had a body lube in 3 years–which perhaps it hadn’t. Yes, I’m cranky about the very poor service and equipment from Northeastern Charter & Tour. Finally we got back to the ship. To the surprise of no one, the driver was right by the door as we alighted, hoping for a tip. We had all seen the prominent sign that said gratuities are always appreciated, and that the tour guide does NOT split with the driver. No problemo, I cheerfully stiffed them both. Let them split that. Maine is beautiful. The cabins by the sea are breathtaking–I’m wondering if we could rent one for a week next summer. I could live for quite a while on lobster rolls and chowder, and spend my life photographing the lighthouses and rocky shores. Avoid the bus tours.